It's been several years since my first visit to Brigantes and I don't believe it was listed on here at the time. It was much busier than I remembered. But it still has a fine selection of ales. This time we also tried the food which was good. Service was attentive and friendly too. Ales on during our visit were Black Sheep Golden Sheep, Great Heck Chopper, York Nordic Fury, Elland 1872 Porter & Catch The Rainbow, Okells MPA, Brass Castle Vanaheim & Rams Head Bitter & Timothy Taylor Ram Tam. Cider was Orgasmic Sweet. The last time I came was before the York Tap opened and it is just about close enough to the station to allow for a fleeting visit whilst changing trains. But I'd stick at the station in the Tap if changing trains again. Nevertheless, Brigantes is worthy of a visit in its own right. 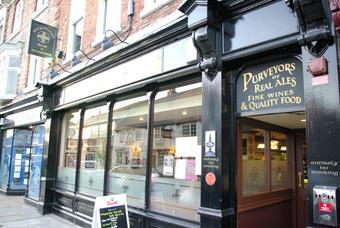 Situated on the lively Micklegate strip, it can get quite busy at weekends. Always a good choice of well kept ales in this bar. 23 ciders and perries on this visit. Always a must in York and handy for the station. Café bar serving decent ales. Seems popular with large groups which can mean a bit of a wait to get served at times. 3rd pub of the day and for me this was by far the best. I tried to get in here 3 months back on my last visit to York but ran out of time, I was not going to miss out this time around. Again it was very busy in here and an orderly queue formed for the bar, the staff were extremely quick and getting served was no problem at all. Massive range of bottled beers also on offer along with a few decent looking ciders. Breweriania all over the walls, church style bench seats, great beer and service what more does any ale drinker want ? For me what more do I want in a bar / pub, nothing! Brigantes does it for me, this is an place and has to be on people tour map when drinking around York.